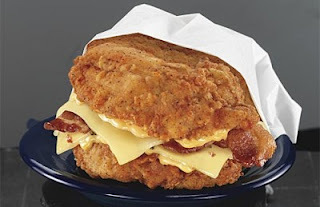 KFC Canada is thanking Double Down fans for a successful Canadian encore – and cautioning that supplies of its deliciously, decadent bun-less sandwich are dwindling fast and expected to run out over the next several days. In early June 2011, Canada’s most celebrated premium chicken sandwich returned to Canada for its second limited time introduction. Since then, KFC fans have been savouring Double Downs at almost the same record-setting pace as during Double Down’s much buzzed-about Canadian 2010 debut, when the Double Down became KFC’s best-selling new menu item in history. Canadians Down Nearly 2 Million Double Downs, eh! “In fact, by the time Double Down’s limited time 2011 run ends, we estimate that nearly 2 million Double Downs will have been served on Canadian soil,” confirms David Vivenes, Senior Marketing Director, Yum! Restaurants Canada, which owns the KFC brand in Canada. “It’s exciting. And, most of all, we’ve appreciated hearing from Double Down fans who’ve been having a lot of fun with the return of the legend,” he says. According to Vivenes, Canada’s summer love affair with Double Down is strong right across the nation; but he says that so far, Western Canada is slightly out-pacing the rest of Canadian Double Down sales. The KFC Canada Double Down boasts two, premium, juicy pieces of seasoned Original Recipe chicken, two pieces of bacon, two pieces of processed Pepper Jack cheese and the Colonel’s Secret Sauce. And, in a new 2011 twist, KFC Canada trimmed the sodium slightly (by about 10 per cent) while still maintaining its trademark taste. Vivenes says there are no plans to make Double Down a permanent menu item since Canadians have told KFC they enjoy best it as a special, limited time event. “This is the last chance to Double Down in Canada for a while, so if you want to try Double Down one more time – or still need to cross it off your bucket list, act fast, ” says Vivenes. KFC is Canada’s largest quick service restaurant brand with more than 700 KFC restaurants across Canada. Since it was founded in Canada in the early 50s, KFC cooks have been freshly preparing and hand-breading our famed, irresistible Original Recipe chicken every day. KFC uses only trans fat free cooking oils – and offers a delicious range of family meals and premium sandwiches, including Double Down. KFC would love to give away a $25 gift card to one lucky Canadian KFC lover. A random draw by Random .org will be made on July 19, 2011 from all Canadian entries recieved. Tell me if you have tried the Double Down . I have not yet tried the Double Down. This is probably the grossest thing that KFC sells! No I haven't tried it yet although I have heard about it on tv and online, I will have one soon! Yes, definitely tried it and love DOUBLE DOWN!! No, haven't have tried the Double Down. I follow yoy by email. I haven't tried the Double Down at KFC. No,I havent treid it yet,but would lvoe to! I have tried KFC's Double Down and it is delicious. Heard that it is so good. But, just love their chicken. Family fav. So far I have not tried the DD, only because KFC is not located in our town and we just haven't stopped there while away in over years. I haven't tried the Double Down. No, I haven't tried it either.